We’d love your help. Let us know what’s wrong with this preview of Scrappy Project Management by Kimberly Wiefling. Projects are MESSY! From the minute the project begins, all manner of changes, surprises and disasters befall them. Unfortunately most of these are PREDICTABLE and AVOIDABLE. Tact and diplomacy can only get you so far in the wild and wacky world of project work. A combination of outrageous creativity, sheer bravado and nerves of steel will serve you far better than any fan Projects are MESSY! From the minute the project begins, all manner of changes, surprises and disasters befall them. Unfortunately most of these are PREDICTABLE and AVOIDABLE. Tact and diplomacy can only get you so far in the wild and wacky world of project work. A combination of outrageous creativity, sheer bravado and nerves of steel will serve you far better than any fancy-schmancy Microsoft Project Gantt chart! To ask other readers questions about Scrappy Project Management, please sign up. One of those "wish I could give negative stars" cases. I couldn't finish this book, it was so incredibly awful. The beginning of the book is full of testimonials and quotes and other nonsense that had me thinking I had somehow found my very first piece of Kindle spam. The writing is at the level of high school girls passing notes in class. I think the author is attempting humor, but instead it just makes her sound like she has no idea what she's talking about. The tone of the author bio in the b One of those "wish I could give negative stars" cases. I couldn't finish this book, it was so incredibly awful. The writing is at the level of high school girls passing notes in class. I think the author is attempting humor, but instead it just makes her sound like she has no idea what she's talking about. The tone of the author bio in the back only reinforces that impression. There is little to no actual substance. The examples are anecdotal at best. The "graphics" or occasional lists and tables use a font that is nearly unreadable and offer very little useful information. You might find more helpful tips from a bad motivational poster, in fact. The author never, ever, touches on any true project management guidelines. She doesn't even bother to explain what a project is -- that it has a deadline and a specific goal. You might sort of get that gist after you're in the third or fourth chapter. This book is outdated now. The same points were stated over and over and over again, while significant considerations that complicated these points were never mentioned. Pulled this old volume off the shelf after started a new project at a new job. Nothing amazing about this one, and it would have probably made more of an impression had I never managed a project before, but it's certainly readable. The very self-assured voice of the author cuts through to the essentials of project management. If you can stand the cockiness, you might learn (or at least re-learn) a thing or two. A mixed bag of some useful project wisdom - clear, relevant and frequent communication, and customer centric Point of view holds a key to a successful project. I have been working as a project manager for over nine years and this is the first book that really gives you the real deal! Kimberly doesn't play nice or pretty up PM...she tells it like it is! Project management is hard and messy and this book really sets your expectations and gives you real concrete advise on the ins and outs of PM. If you are new to project management and need some tips and tricks on how to be successful this book is it!! The unserious tone was more distracting than entertaining but it was a quick read and had some good high-level reminders and tips for how to effectively manage projects, which is what I was looking for. Some useful ideas, affected how I think about the MIDDLE of projects. No rocket science here, but a quick read of solid principles and pragmatic guidance. A pep talk with substance to back it all up. There weren't any revelations here for me, but an enjoyable read nonetheless. 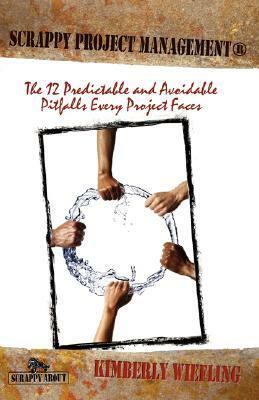 A good book discussing what can go wrong during projects and how to avoid those pitfalls. Good lead up material for my upcoming classes.